↑ "The French defense procurement agency (DGA) takes delivery of its 1st retrofitted Rafale "Marine" from Dassault Aviation" (Press release). Dassault Aviation. 7 October 2014. Retrieved 25 October 2014. ↑ "2014 first half-year results" (Press release). Dassault Aviation. 25 July 2014. Retrieved 4 October 2014. ↑ ၇.၀ ၇.၁ ၇.၂ ၇.၃ Projet de loi de finances pour 2014 : Défense : équipement des forces et excellence technologique des industries de défense (in French)။ Senate of France (21 November 2013)။ 2 July 2014 တွင် ပြန်စစ်ပြီး။ “Avant prise en compte du projet de LPM, le coût total du programme pour l'Etat était de 45,9 Mds €2013. Le coût unitaire (hors coût de développement) de 74 M€2013 pour le Rafale B (pour 110 avions) de 68,8 M€2013 pour le Rafale C (pour 118 avions) et de 79 M€2011 pour le Rafale M (pour 58 avions)." "France prepared to "go it alone" on ACX" (13–19 January 1983) 123 (3850). London: Reed Business Information. "Air Superiority" (4–10 December 1983) 124 (3892). Surrey, UK: IPC Transport Press. ISSN 0015-3710. "How to Survive a Dogfight Blackout" (20 March 1986) 109. London: Reed Business Information. ISSN 0262-4079. "Military Aircraft of the World" (21–27 August 1991) 140 (4281). London: Reed Business Information. ISSN 0015-3710. Retrieved on 15 February 2013. Gaines, Mike (4–10 June 1989). "Rafale: Dassault's New Dawn" 135 (4168): 80–88. London, UK: Reed Business Information. ISSN 0015-3710. MacKenzie, Christina (19–25 March 2002). "Rafale Readies" 161 (4824): 36–37. London: Reed Business Information. ISSN 0015-3710. Retrieved on 19 October 2013. Sedbon, Gilbert (26 January – 1 February 1986). "Rafale partners sought formally" 129 (3996). London: Reed Business Information. ISSN 0015-3710. Retrieved on 13 January 2013. Sedbon, Gilbert (6–12 July 1986). 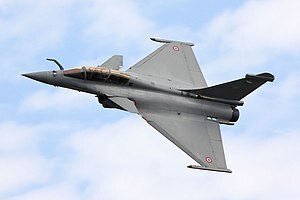 "Dassault flies Rafale demonstrator" 130 (4019). London: Reed Business Information. ISSN 0015-3710. Retrieved on 12 January 2013. Sedbon, Gilbert (14–20 February 1988). "Crouzet controls by voice" 133 (4101): 30–31. London: Reed Business Information. ISSN 0015-3710. Retrieved on 19 October 2013. Sedbon, Gilbert (29 October – 4 November 1989). "French Navy breaks ranks over F-18 sale" 136 (4189). London: Reed Business Information. ISSN 0015-3710. Retrieved on 14 January 2013. "Belgium denies interest in lighter Rafale B" (12–18 January 1986) 129 (3994). London: Reed Business Information. ISSN 0015-3710. Retrieved on 13 January 2013. Armée de l'Air (official page) (in French), Ministère de la Défense . Dassault Rafale (article), Air Combat Information Group .